Joyce Pensato, Untitled, 1992, oil on linen, 36 × 36”. Homer, Kenny, Donald, Mickey: Joyce Pensato’s painterly masticating of these American cartoon icons—distilled in black-and-white enamel—have been seducing audiences for decades. 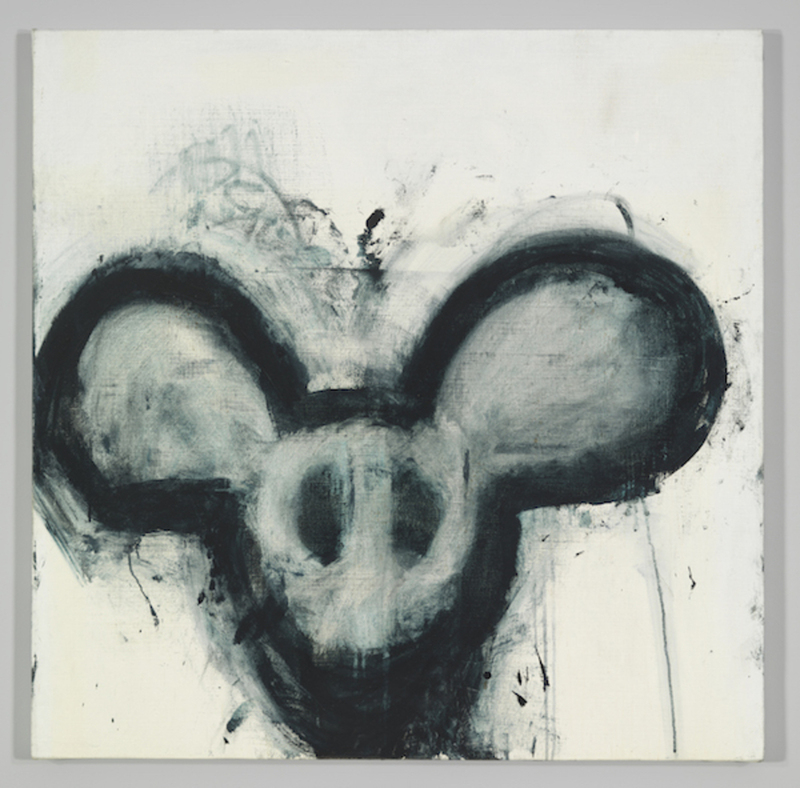 One of her earliest Mickey Mouse paintings will be featured in the Whitney Museum’s survey of image-making in downtown New York, “Fast Forward: Painting from the 1980s,” curated by Jane Panetta and Melinda Lang. The exhibition opens on January 27 and runs through May 14, 2017. I’ve had so many incredible people in my life. Thea Westreich was like my fairy godmother in the ’80s, collecting my work and boosting me up. Mercedes Matter was the first person to see my Mickey drawings and really encourage me in that direction—she was one of my teachers and mentors at the New York Studio School when I was a student there. I met Christopher Wool at the NYSS as well. He introduced me to my first collector, his dad, Ira, who was like a proud father, my biggest cheerleader. The Woolies are very important to me. Joan Mitchell was a mentor of mine too. But she could be kind of brutal. She would say, “Do you want to be one of those German Expressionists, all dark? Or do you want to be one of the French painters, like Matisse or Cézanne, with light and color?” I wanted to please her, of course, so I’d say, “I want to be French!” But I realized I was one of those expressionist painters. The last time I saw her, she was at my first group show in Paris. God, she just loved giving me a hard time. She would say, “Are you still doing those animals?”meaning Mickey Mouse and Donald Duck; or, “Do you still have that skin disease?”referring to the rough textures I like using in my work. Ha—she was a tough broad.